Here is our selection for June’s Curious Tea subscriptions for you to try. All teas are brand new to our Curious Tea selection and are from the 2016 spring harvest. We have selected the following four teas for you this month: a classic, super smooth Imperial Dian Hong; a fragrant Jasmine Girl Rings green tea; an unusual Red Jade GABA from Taiwan and finally a white tea from Yunnan, White Moonlight. Mixed: Nu Er Huan Jasmine Girl Rings and Dian Hong Imperial Feng Qing. To help you along with the tasting, here is some further information on all teas featured in our June boxes! Jasmine Nu Er Huan (茉莉女兒環) is a scented green tea that is produced in Guangxi Province of China. The name of this tea, which translates from Chinese Nu Er Huan as Girl(‘s) Ring or Daughter(‘s) Ring, comes from the shape of the dried leaves. They are hand formed into little silver rings, which are reminiscent of small delicate bracelets or rings worn by girls. The production process follows a classic recipe of scenting the tea leaves with jasmine blossoms. The processing starts with hand plucking the choicest buds. These are shaped by hand into small rings and then undergo the scenting process. This involves layering the tea leaves with fresh jasmine blossom in alternating layers so that the leaves acquire the heady jasmine aroma. The blossoms are removed from the finished tea – leaving the jasmine blossom in can deteriorate the quality of the tea and result in a bitter taste. Jasmine tea is popular in China and is often used as a welcoming gesture to guests. We chose this Nu Er Huan Jasmine Girl Rings green tea for our June Mixed and Light subscription boxes. This tea is from the spring 2016 harvest. It is one of the rare times when we do feature a tea that has had additional flavour added – in this case the process of traditional scenting using jasmine blossom. This jasmine green tea comes in tightly rolled little silver rings that unfurl into full green buds in your tea pot when you brew them. There is a heady scent of jasmine coming from this tea on the first infusion. Subsequent infusions have a more subtle jasmine flavour. The flavour is light and smooth with sweet floral notes. The taste is lighter on the first infusion, becoming fuller and more balanced on subsequent infusions. We suggest brewing parameters of 80°C for 2-3 minutes according to your taste. It can be brewed 3 or more times depending on your taste preference. Use glass teaware, if you can, to enjoy the beautiful unfurling leaves. 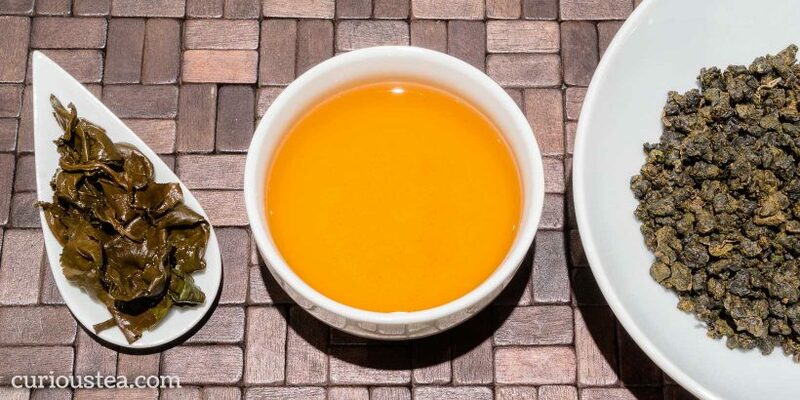 This Nu Er Huan Jasmine Girl Rings green tea produces a very satisfying cup of tea that is pleasant to drink on its own or it also goes exceptionally well with most types of food. You can buy Jasmine Girl Rings green tea in our online shop. 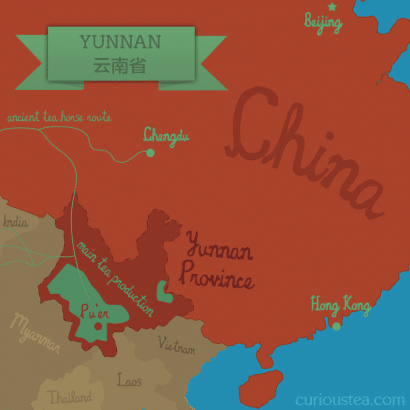 Yue Guang Bai (月光白) is a white tea from Yunnan Province. If you tried the Yunnan Silver Needle last month, this white tea is quite similar but it is even more robust and reminiscent of a young pu-erh. The name Yue Guang Bai translates as White Moonlight and most likely comes from the appearance of the dried leaves, which are silver-white and black in colour. We selected this tea for our June 2016 Light box. It was plucked in mid spring 2016, so it is extremely fresh. The leaves have been carefully hand processed resulting in a beautiful mixture of silver buds and larger black coloured leaves – the result of the oxidation process while being sun dried. When compared to Yunnan Silver Needle, White Moonlight is a much bolder tasting tea. This is the direct result of using not only the buds but the one or two leaves next to the bud. The flavours in this tea are well balanced and lean towards sweet and woody notes. There are fruity and floral aspects to the flavour that remind us of cherry blossom. Yue Guang Bai White Moonlight tea is best brewed at 80°C for 2-4 minutes according to your taste. It should definitely be brewed multiple times, increasing water temperature and steeping time with each next brew if desired. Like with all white teas, you can experiment with lower temperature and longer steeping time as an alternative way of brewing this tea. You can buy White Moonlight white tea in our online shop. 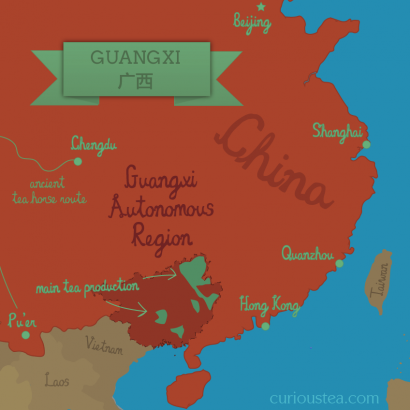 We selected this Dian Hong Imperial Feng Qing black tea for our June Mixed and Dark boxes. The tea was plucked and processed in April 2016. The dry leaves are very long and thin, black and gold in colour. The brewed leaves retain their shape and produce a medium strength liquor. This tea has a very pleasant malty scent with a hint of rose hip aroma. The taste is balanced, sweet and malty with a hint of hibiscus on the aftertaste. This is a perfect black tea to have without milk as it’s very smooth and does not have any astringency. Of course, it can always be brewed stronger by steeping the leaves for 5+ minutes to make a particularly strong tea that could take a dash of milk. Dian Hong Imperial Feng Qing black tea is best brewed at 90°C for 3-4 minutes according to your taste. It can also stand multiple infusions well. You can buy Dian Hong Imperial Feng Qing black tea in our online shop. Our last tea for June is an unusual black tea from Taiwan, Red Jade GABA (紅玉加碼), also known as Ruby GABA. This tea is made from Hong Yu TRES No. 18 cultivar. Hong Yu translates as Red Jade or Ruby, hence the name for this tea. The Red Jade cultivar was developed in Taiwan very recently in an attempt to reinvigorate black tea production of the country. This cultivar was developed from an Assamica strain from Burma and the local wild tea from Taiwan. By the way, the Taiwanese Wild Shan Cha is available to buy in our online shop, where you can also read more about that unique strain of Camellia. Wild Shan Cha compares interestingly to the new Red Jade cultivar. 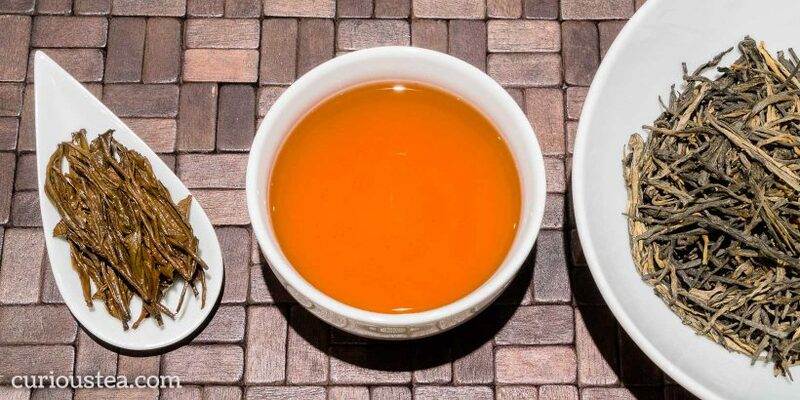 They both exhibit similar qualities, however the teas made with the new Red Jade cultivar have a unique eucalyptus and mint edge to them. But if you try them side by side you can definitely see the ancestral relationship between them. 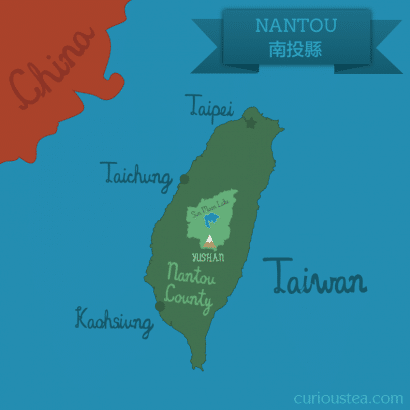 Our Red Jade GABA black tea is organically grown around Mingjian Township of Nantou County. This crop is from April 2016. After plucking and rolling, this tea undergoes oxidation in an oxygen deprived environment. 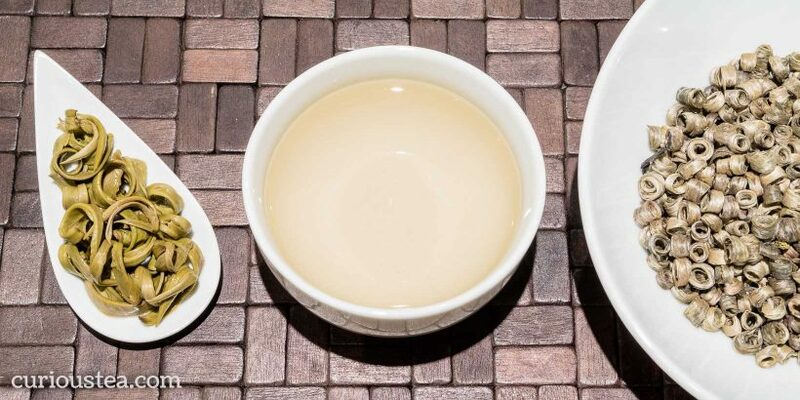 This is the unique process that is employed to achieve all GABA teas. The tea is placed into large tanks. Oxygen is then flushed out with nitrogen and the tea is left to oxidise. As the environment is oxygen deprived, the oxidation process happens very slowly. This results in a much larger amount of GABA molecules being present in the finished tea. This Red Jade GABA black tea was selected by us for our June Dark boxes. Tightly rolled oolong-style leaves produce a medium strength liquor with a scent of raisins and currants. The taste is crisp and very mellow, which is the result of the slow oxidation process. The flavours prevalent are of sweet raisins and tart dried fruits. The flavours linger in your mouth and there is a definite minty aftertaste detectable that is a characteristic quality of this tea. Although the flavours do linger, the finish is very clean without any tannins or astringency. A very interesting and unusual tea – definitely worth taking time to enjoy this one! 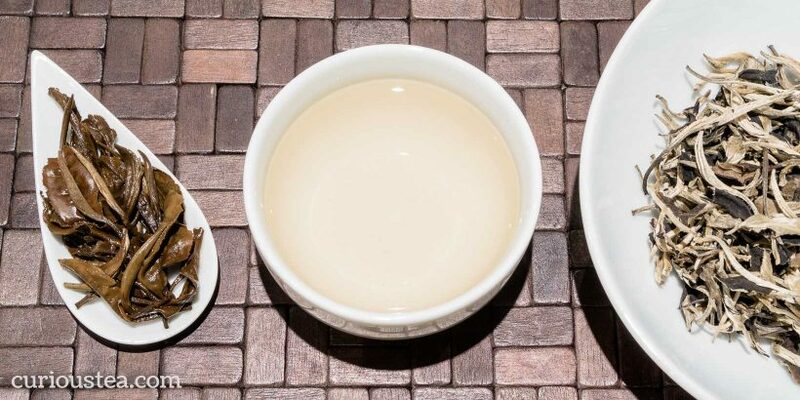 This tea is best brewed with water at 90°C for 3-5 minutes and can be brewed multiple times. This tea is absolutely delicious cold so make sure to try this as an iced tea! You can buy Red Jade GABA black tea in our online shop. We really hope that you enjoy the tea club selection for June and are looking forward to what we have in store for your selections in July!